The Starbucks on 99th and Broadway is the most recent addition to the Upper West Side and possibly Manhattan altogether. I only discovered this location last week and after paying it a quick visit I found it the Starbucks is only a few weeks young. And now I’m back to stay awhile and soak it in before the year is up and over. Speaking of soaking… it’s presently pouring here in New York. Luckily, I was able to dive into this Starbucks just before it really started coming down. And I’m not the only one seeking shelter and a warm beverage until the rain lets up. Although I wouldn’t say this Starbucks is all too crowded, it is relatively small and fills up kind of fast. There’s just three barstools and one communal table to share with no public restroom — which is probably why the crowd doesn’t linger all too long. Thankfully, this location was beautifully designed with all of Starbucks latest and greatest decor such as in-wall refrigeration units and wood paneling throughout. So even if your visit is a short one, it can still be a pleasant one. The Location… Just a few blocks north of the 1/2/3 trains off Broadway in the Upper West Side. The Decor… Accent walls of both exposed brick and wood panels with framed photos of the coffee harvesting and roasting process. The Size… It’s a small corner Starbucks with a handful of seating. The Seating… Just a long community table in the center of the room and three barstools pulled up to the barista bar. 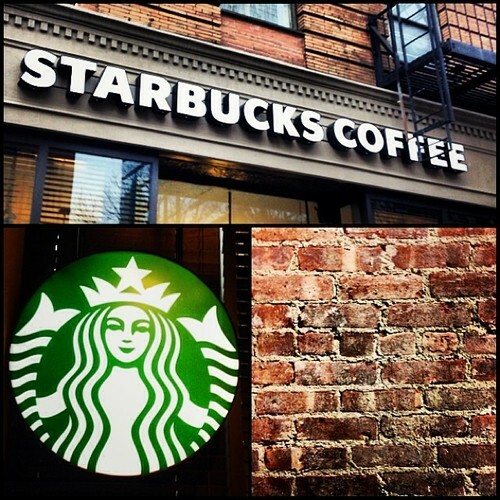 The newest Starbucks addition to the Upper West Side.